The new customer experience at 23andMe is about more than just our new look; it’s also about new features. Among those new features are our new Trait Reports. These reports can be a fun way to learn how your genetics influence such things as the color of your eyes, whether you’ve got dimples, and if you have a sweet tooth. But when designing these reports, we also wanted to illustrate that it’s not just your genetics that determines these traits, but other factors as well. 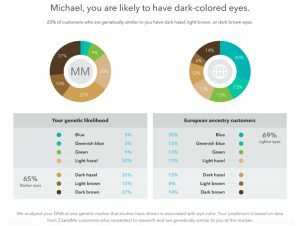 What’s also useful about these reports is that they can tell you how similar or unique you are when compared to the rest of 23andMe’s customers. The concept behind how we report the Trait results is fairly simple. To start with, each report is based on specific genetic markers associated with that particular trait. (Customers can read more about how we determine which markers to use in the Scientific Details.) Then, the analysis using these markers is summarized at the top of each report. As one example, consider the report on eye color. This report is based on a single genetic marker, , that plays a large role in determining eye color. At this marker, your genotype could be either AA, AG, or GG. If you have an AG, 23andMe analyzes the data from 23andMe research participants who also have an AG, and in the left ring chart shows the percentage of those people who have brown, hazel, green, or blue eyes. 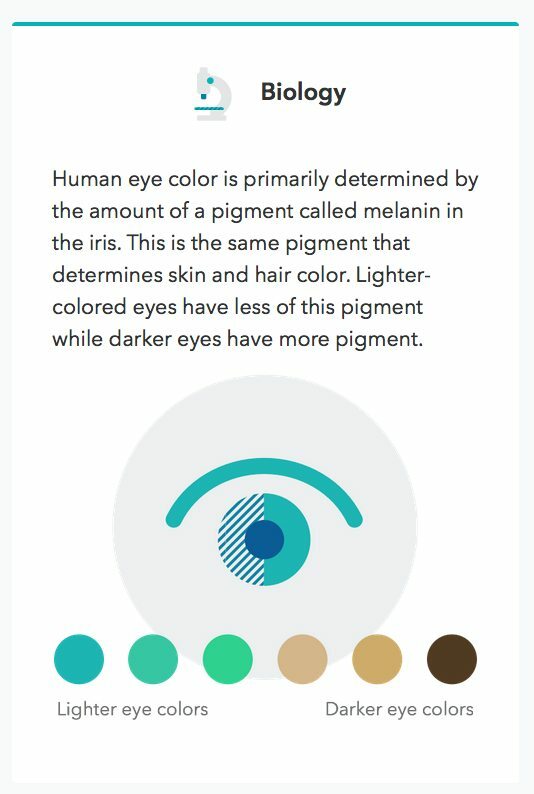 In other words, the left ring chart is the eye-color breakdown of research participants who have your same genotype at this marker and have answered the eye-color survey question. 2) The ring chart on the right shows how common that trait is overall in 23andMe customers, regardless of genetics. 3) The result headline at the top predicts whether you are likely to have the trait, and how that compares to other customers with your genotype. This summary is based on the sum of percentages from the left ring chart. Most human traits are complex, meaning they are not determined by a single factor. Even when we find genetic factors that have a large effect on a trait, they still explain only a portion of it. This means that we can only determine the likelihood of having that trait. That means there is still the chance of not having that trait. 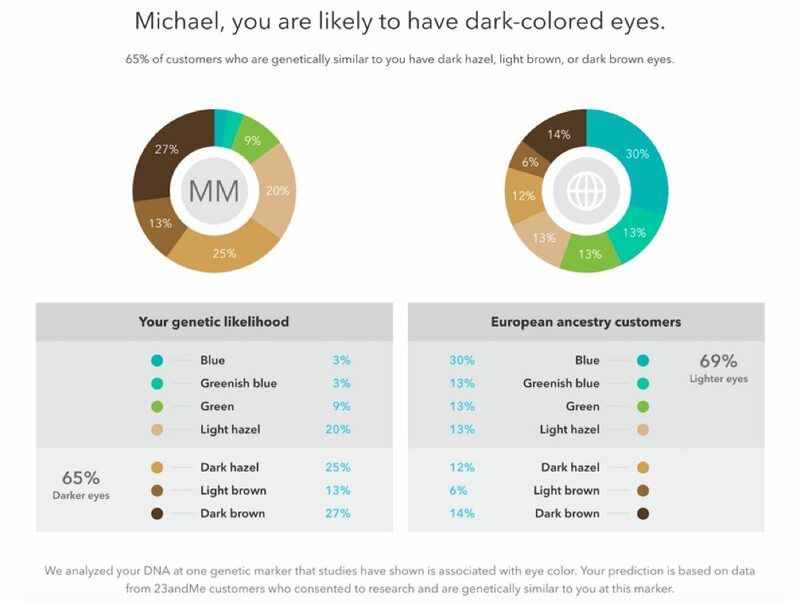 We see this in the data from our customers: out of the 23andMe research participants we looked at who have an “AG” at , around 35 percent have light eyes and 65 percent have dark eyes. So for about 35 percent of customers with reports that state that they “are likely to have dark eyes,” they actually have light-colored eyes. But for some genotypes, the prediction is much stronger. For example, someone with a “GG” genotype has a 97 percent chance of having light eyes. Still not 100 percent, but much more likely. 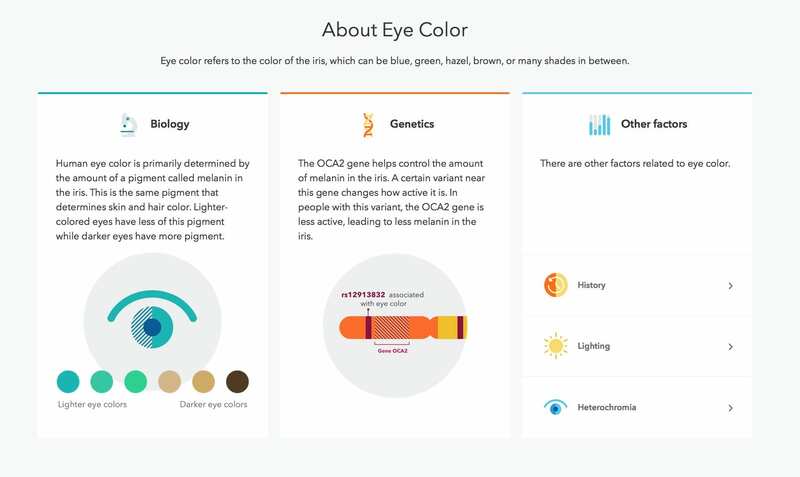 Many other factors influence eye color, including your ancestry, other genes, and other non-genetic factors. The same goes for all of the other traits in our reports, too. That’s why we also include a section in each report that talks about some of these other factors. The results are based only on specific genetic factors that we know about now, but our predictions may get better as we learn more. And your participation in surveys will help us do this by providing more and more data to work with going forward. Trait Reports and the 23andMe research behind some of them are about more than just fun facts. Typically there isn’t research money to support studies into the genetic basis of “having a cleft chin,” or other seemingly inconsequential features, even though some of this research could potentially shed light on broader questions about human development and health. Aside from 23andMe, there are very few large-scale studies about these kinds of traits. The only reason we are able to do this research is because we have the right quality and quantity of data – thanks to our customers who participate in research. 23andMe is extremely grateful for the generosity of our customers in sharing information about themselves. In the future, we hope to apply what we’re learning about traits to other aspects of our product, especially those concerning health and disease risk.